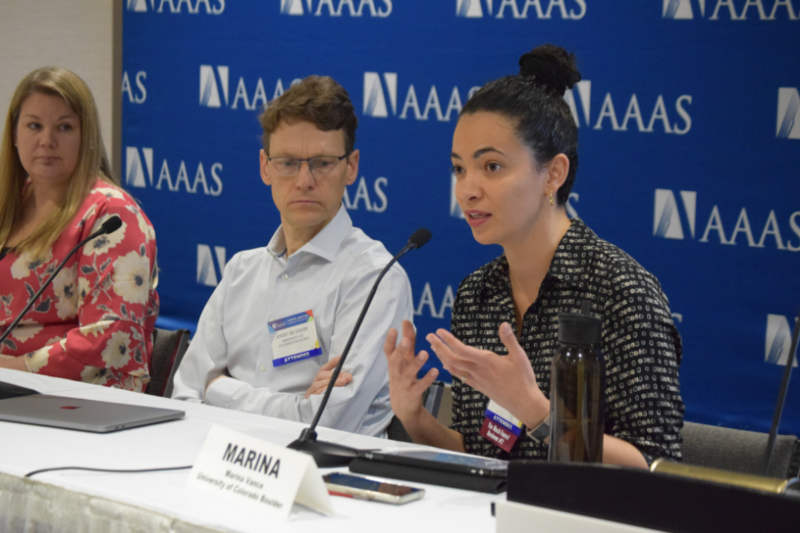 Materials in our homes like vinyl flooring and activities as common as cooking dinner can pollute indoor and outside air and cause detrimental health impacts, according to new research shared at a Feb. 17 news briefing at the 2019 AAAS Annual Meeting. Many household products and materials like insulation, flooring and furniture are chemically treated for a variety of reasons, including making the materials shiny or stain resistant. Yet contact with such chemically treated products results in the chemicals ending up in our bodies at higher rates, said Heather Stapleton, associate professor of environmental health at Duke University. Stapleton shared results from a new study that found children who live in homes where the sofa contained flame retardants known as polybrominated diphenyl ethers in its cushions had concentrations of PBDEs in their blood six times higher than children not exposed to such materials. PBDE exposure has been linked to neurodevelopmental delays and endocrine disruption, among other adverse health effects. Children living in homes with vinyl flooring had 15 times higher levels of benzyl butyl phthalate metabolite in their urine than children living homes without vinyl flooring, Stapleton’s study also found. Benzyl butyl phthalate, which is used to make materials softer and more pliable, has been linked to health concerns that include respiratory and reproductive disorders. “Our research suggests that there’s thousands of chemicals we’re exposed to on a daily basis in the indoor environment,” Stapleton said. Other research investigated how activities like cooking and cleaning affect air quality inside the home. Marina Vance, assistant professor of mechanical engineering at the University of Colorado Boulder, previewed results from a collaborative study she led called House Observations of Microbial and Environmental Chemistry (HOMEChem). During the monthlong project, researchers set up a test home where they conducted experiments that mirror everyday activities like cooking and cleaning and tested the effects on indoor air quality. In one experiment, team members prepared a Thanksgiving dinner, an activity that resulted in high levels of particulate matter in the air, Vance said. If the results were measured against the U.S. Environmental Protection Agency’s Air Quality Index, the indoor air quality briefly spiked to the “very unhealthy” classification, the second highest level of health concern, she added. Particle pollution has been linked to respiratory ailments, heart attacks and strokes, according to the EPA. Researchers agreed that further work is needed to better understand the compounds and chemical processes in our homes. Yet the two spheres are inextricably linked: Indoor pollution also affects outdoor air chemistry – increasingly so, according to Joost de Gouw, visiting professor at Cooperative Institute for Research in Environmental Sciences at University of Colorado, Boulder. While the transportation sector has historically been a significant source of outdoor air pollution, Clean Air Act standards have led to cleaner cars and trucks and thus pollutants originating indoors – such as chemicals from cleaning and personal care products – have taken on increased importance. “Think about all of the bottles you have in your bathroom, in your kitchen, in your garage,” said de Gouw. The researchers offered suggestions for people minimizing the impacts of polluting products and processes. De Gouw suggested using fewer cleaning or personal care products, if possible. Vance recommended ventilating the kitchen while cooking. Since the study, she has made a habit of using the exhaust hood every time she turns on her gas stove, she said. Even something as simple as washing your hands before you eat can help mitigate the health impacts of chemically treated products, Stapleton said. While some chemicals in household products are transferred through the air or through contact with the skin, many are transferred through hand-to-mouth contact, she said. Stapleton also recommended that consumers seek out information about the products they plan to buy for their home. “Ask what’s in it. See if you can get more information. It’s pressure from the public that helps bring awareness to some of the manufacturers and can raise more interest in understanding what we’re using and what the potential risks are,” Stapleton said.